Consider the table given below. This example shows the number of winners in the Olympics from different countries. 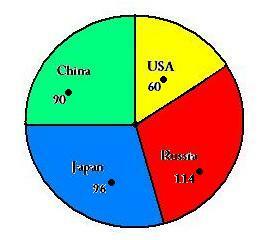 The frequency distribution, 60 (10+15+16+19) observations, are divided into 4 different components: USA, China, Japan and Russia. The value of each component represents the number of winners of the corresponding component, the sum of which is 60. A pie chart is a method of representing data or values of different components of a frequency distribution using divisions in a circle. These divisions are known as sectors. The sectors above are constructed in such a way that the area of each sector is proportional to its corresponding value of the component in the given table. From our lessons in geometry, we know that the area of a sector is directly proportional to the angle subtended by its arcs at the centre of the circle. So, to construct a pie chart from the component values, we can calculate the corresponding angles at the centre. We know that the sum of all central angles is 360◦. Now, let us try and make a pie chart from the Olympics winners’ table ourselves. 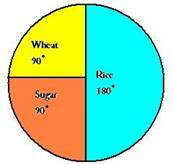 whenever we are given some data, we can easily construct its corresponding pie chart. The converse is also true, i.e. the component values can be found by using a pie chart. So, whenever we are given a pie chart, we can easily find the related data. 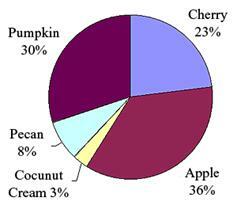 Consider the pie chart given below. Thus, we can find each commodity. Frequencies of the components which are expressed as a percentage of total frequency are known as relative frequencies. Twenty people out of 100 prefer pizza as their favorite take away food. If a pie graph was drawn to reflect this, what angle would the sector for pizza take up?